As today is Halloween, we thought we would highlight the top 5 intranet nightmares that plague your employees. 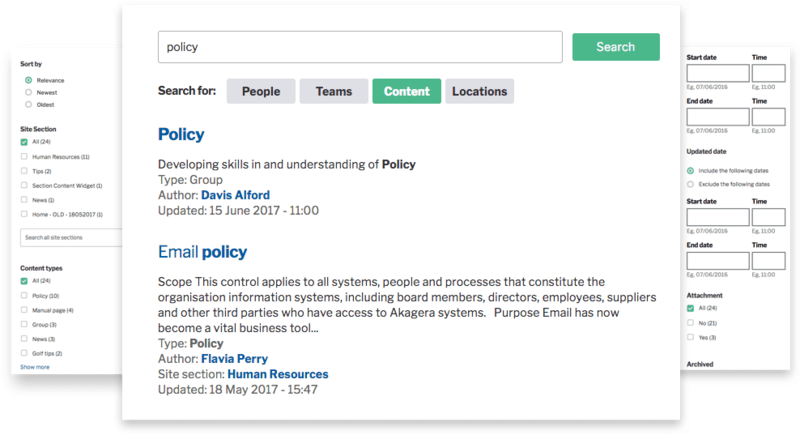 Having an easy to use search that provides your users with the information they are looking for is paramount for a successful intranet. Your employees do not have time to waste, therefore being able to locate content, people and data needs to be an efficient process. Our search directory is segmented into People, Teams, Content and Locations, making it easier for your users to find what they are looking for. You can also configure the search filters. For example, by location, date or interests. You can define search synonyms so that multiple words that have a similar/the same meaning can show up in people’s search results. For example ‘lawyer’ and ‘solicitor’. This function is extremely useful for giving people a higher chance of finding what they are searching for. Search highlights allow you to promote certain pieces of content to the top of search results. This comes in handy for many things. For example, if someone was to search ‘GDPR’, you could make it so your GDPR policy is at the top of your users’ results. So many intranets these days are full of outdated content that cause clutter. You want to have a system in place that helps you to keep your content relevant and up to date. Invotra offers review dates, meaning that the owner of the content is reminded on a certain date to take a look at the piece of content to see if it has become outdated. It might need updating, or, simply deleting altogether. Review dates are an extremely simple but super effective tool to decrease the amount of outdated content haunting your intranet. Being able to locate people and their information with ease is paramount for a good intranet. Invotra People consists of several taxonomies, people, teams and locations. Each of these separate taxonomies serves to create a highly customisable, scalable service and can all be used to make your searches more specific and tailor the information that is presented to whatever your needs at the time may be. Searching by teams or locations breaks down your employee base into a far more easily searchable format. The ability to view people specific to a team or location increases the ease with which managers can organise their employees. We understand the confusion that can be caused with regards to hierarchy and structure within organisations, particularly the larger ones. This is where our “Org Chart” feature is extremely useful. With this tool, you can create a detailed, organised flowchart, depicting the workflow and hierarchy within your company. 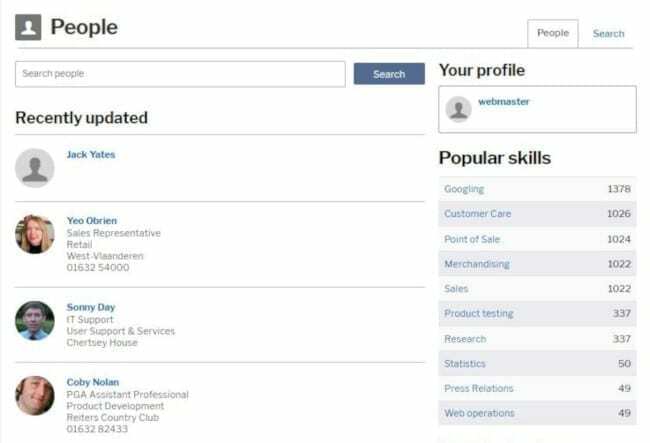 The Org Chart exists both as a site section and as a widget in the user profile section displaying in a two-up, one-down fashion in order to ensure it is easily legible. Invotra also built out a “Team Chart” feature, which, like the “Org Chart”, builds itself out in order to save you time. With our people directory, it will no longer feel like you are lost in a maze! Scary Security – Are your people protected from attack? Is your data secure? You want to be able to rest assured that your intranet is secure, both in terms of what hosts it and the data/content held on there. Invotra is a cloud-based company. We operate on an Amazon Web Services infrastructure. You can always rest assured that we are using an extremely secure hosting platform. In terms of providing security for your intranet’s content, we have many roles and permissions that limit what a user can do, giving them only the necessary access. You can also restrict entire site sections, choosing to give only certain users access. Find out more about this topic here: How secure is your current intranet? Design – Does changing your layout feel like performing an exorcism? You need to be able to design and build the intranet you want, when you want it. We offer IPE (in place editing) that allows you to change, edit and move various different widgets on your intranet without needing external help. Re-organise the layout of your page including where different widgets sit with absolute ease, using our drag and drop functionality. 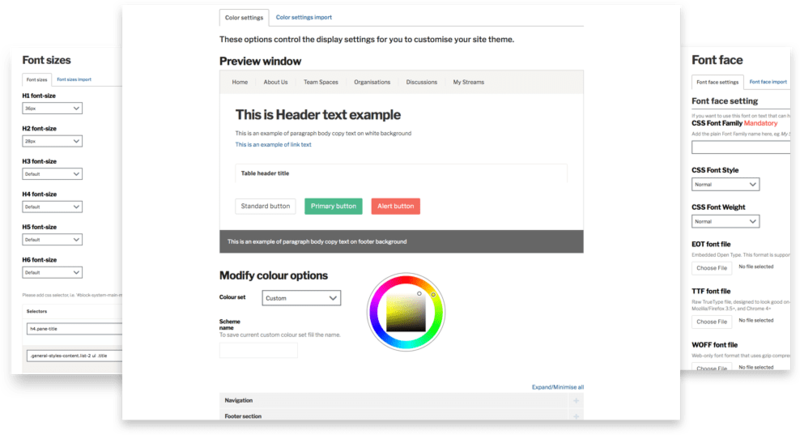 These options allow you to completely customise the look and feel of your intranet at the press of a button. We have built an intuitive interface in order to ensure you can customise to the extent that Invotra can be customised. Ensuring that your intranet fits with your organisational identity and enhances user experience means that you find the right balance between corporate and social.